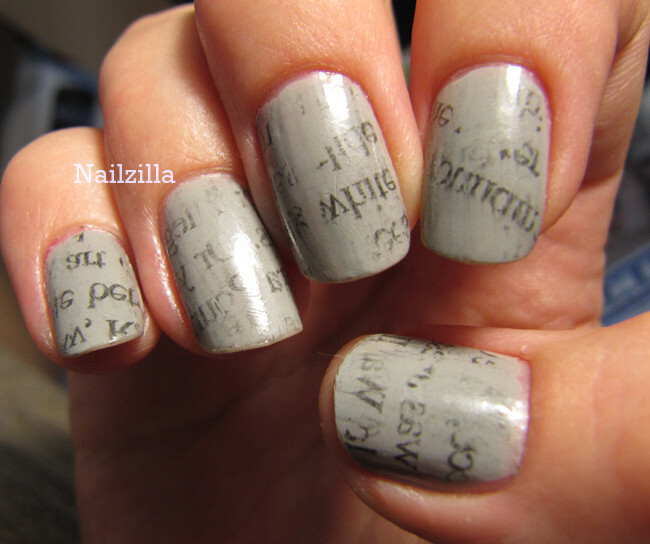 This is another one of my older manis, I tried my hand at newspaper nails! I used a tutorial where you dip the newspaper in rubbing alcohol and then press onto your nail for a few seconds so the ink transfers. The pinky came out really well but the rest...not so much! Not sure what I did differently to make the pinky come out right, but I wouldn't mind trying it again sometime. What a really cool look when it comes out well! Wow, wow, wow! How do you do this? I mean I know you said to dip it in rubbing alcohol but wouldnt that mess up the polish? Apparently not! The polish stays fine while the ink transfers. Alcohol doesn't dissolve polish the way acetone does. I press an alcohol soaked square on the nail for about 10 seconds and peel it off. Then topcoat!